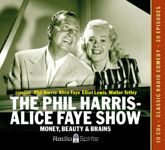 The Phil Harris-Alice Faye Show was one of radio�s brightest lights; a hilarious situation comedy featuring a friendly sardonic and sarcastic edge that set it apart from its contemporaries. Featuring Phil Harris, fresh off plying his comedic and musical talents on The Jack Benny Program, and his movie star wife Alice Faye. The show also starred Elliott Lewis as the remarkable Frankie Remley -- one of radio�s most unforgettable characters�a humorously irresponsible con-artist with an endless thirst for the good stuff. Rounding out the regulars is Walter Tetley as Julius Abruzzio, a nervy grocery boy with a Brooklynese accent who served alternately as foil or patsy for Phil and Remley�s various schemes. Also starring are Gale Gordon, Robert North, Jeanine Roos, Anne Whitfield, and announcer Bill Forman.